Please review this checklist to avoid unpleasant surprises after your new kiln is installed. Make sure of your electricity and your physical environment. Then you can place your kiln order with complete ease of mind! This checklist should be used for anyone specifying a kiln, including architects. Kilns are appliances with a few special characteristics, such as high power draw, ventilation requirements and unusually hot surfaces. A few hours work up front can save lot of trouble and expense later. Get the PDF Version of this. What Voltage Do You Really Have? What Phase Do You Have? The first item on the checklist is electricity. Make sure that you know your voltage and phase before placing an order for a new kiln! We can supply kilns with either 208, 220, 240, 380 or 480 volts, single or three phase all depending on your power characteristics. If you do not know for sure what your power is, have an electrician check it for you. L&L makes different heating elements for 208 volts, 220 volts, 240 volts, 380 volts and 480 volts. It is not easy or cheap to change the kiln from one voltage to another once it is installed. A kiln supplied from the factory for 240 volts will have 25% less power if operated on 208 volts – and this will result in slow firing, and perhaps underfiring if not corrected. Many schools and factories in the United States have 208 volts whereas almost all homes in the United States have 240 volts. (Nominal 240 volts can actually be as low as 220 volts). Some people think they have 220 volt power because many appliances are designed to run off either voltage and are labeled 220. Even if you only measure 220 volts (if you are in the United States), this is probably due to an under-voltage condition. You wouldn’t normally want to have 220 volt elements because if the power does go up from the measured 220 volts then the kiln would be overpowered and it could draw too many amps for the circuit. Note that utility companies typically allow for a 10% voltage fluctuation. And also check for proper phase. Most residential buildings have single phase power which consists of 2 hot wires and a ground wire. Many commercial areas have 3 phase power available which consists of 3 hot wires and a ground. You also need to make sure that your home or building has enough ampere capacity to carry the electrical load of your new kiln. Each kiln model is listed with voltage, phase, KW, and amperes. Using these electrical specifications, check the listed amperes and check that your building power supply is adequate. A trickier thing to know is the real capacity of your power grid. We have sometimes seen situations (rarely, but very annoying when it happens) where the demand put on a specific power grid ends up lowering the voltage of the entire grid. For instance you might go in and test the lines and find you have 238 volts and then, when a large kiln is firing, have only 218 volts. Again, if you do not know for sure whether your power supply can handle this new load, have an electrician check it for you. NOTE: like anything else there are good and bad electricians. Chose one with care by getting a few references. We recommend having a separate fused disconnect box with a lockout provision mounted near the kiln, even if you also have a separate circuit breaker for your kiln. This way you can easily turn off power to the kiln and prevent unauthorized people from turning it on. We recommend this even for kilns with plugs because it makes it so much easier to disconnect all power to the kiln when not using it. The National Electric Code states that you need to fuse a device (your kiln) for 125% of "Full Load Amps". Full load amps are the highest amperage draw of the kiln when firing. This information is listed in the kiln specifications and on the wiring diagram. Multiply this number by 1.25 to get the minimum fuse capacity and then go to the next highest fuse size available. For instance a JD2927-3 240 volt, single phase kiln draws 57.0 full load amps. Multiply this by 1.25 to get 71.25 amps. Bump this up to 80 amps (the next highest size fuse available) to get your fuse size. This information can also be found in the kiln specifications and on the wiring diagram. Read more about fusing a kiln. Try to locate the kiln within 50 feet of your breaker box. For longer runs you will probably have to increase the size of the hook up wire that we recommend in our literature. In any case, be sure to have a licensed electrician who knows the National Electrical Code hook up the kiln and size the hook up wire. Read more about kiln electricity and voltage drop. Make sure your electrician properly grounds the kiln and then tests for proper grounding after the installation. Be sure not to ground the kiln with more than one ground because you can set up a small current which can affect the control. It is cheaper to use aluminum wire and you may be tempted to do so. Many electricians will tell you that, with the new types of connectors, it is OK. However, it is of particular importance with kilns not to use aluminum wire for the hook ups. When aluminum wire gets hot it accelerates oxidation. Aluminum oxide is a resistor; copper oxide is not so much. If the connection at the terminal board gets oxidized it will really heat up – to the point where it could cause a fire. It can and has happened. Read more about kiln electricity and wire resistivity. Hook-up wire sizes are provided for many of our kilns in the electrical specifications. However, this can vary depending on ambient temperature conditions and length of wire run. Read more about kiln electricity and wire gauge. Running power for your kiln over a long distance will result in a drop in voltage. This chart gives some approximate idea of this. These estimates are dependent on the kiln operating at 50% to 100% of its capacity, with the temperature of the wire no more than 167°F. If your kiln has a cord with a plug, the receptacle should be in such a way that the cord hangs down (not up). Do not place the receptacle so close to floor that the kiln cord bends up at a sharp angle. The principle to pay attention to is make sure the plug seats securely in the receptacle. Otherwise it could overheat and corrode which could cause an electrical fire. Note that not all L&L kilns come with power cords. Any kiln that draws above 48 amps at full load must be direct wired. See the specific specifications on each web page for each kiln and for each voltage to find out if a cord comes with your selected kiln. Read more about power cords. Rout Power Cord away from kiln in such a way that it can not touch the hot case of the kiln. If you are getting a "direct hook up" kiln (all kiln sizes above 48 amps and most 3 phase kilns) be sure to have the kiln wired so that the final connection to the box is flexible (for instance, by using liquid tight flexible conduit). Ideally, the kiln should be wired to a fused disconnect box located within 15 feet of the kiln. This way, if you ever need to remove the control panel for factory service you can turn off power to the kiln, unhook the 3 or 4 wires from the control box terminal block, and remove the panel. Use a supply wire size large enough for the whole circuit amperage - not just the amperage that the kiln is pulling under load. All L&L power cords are rated for 105°C. Anything less than this can cause a malfunction and possible fire where the power leads connect to the control box. It is OK, and will not void the warranty, to remove the plug that comes with the kiln and direct wire the kiln. However, the connection wires must be rated for a minimum of 105°C. Protect the wire with flexible or rigid conduit. Read more about electrical connections. Extension cords are only OK to use for the 120 volt vent system. Do NOT use an high power extension cord for the kiln. A long wire can act as a resistor and get hot. Some utilities offer special rates for running energy intensive appliances (like kilns) during off-peak hours. Check with local utility. This would require a special time-of-use electrical meter. See ELECTRICAL THEORY AND APPLICATION FOR ELECTRIC KILNS for a complete description of electrical theory, fusing, hook-up wire sizes, etc. as they apply to kilns. See look up INSTALLATION in the Knowledgebase. The kiln must be kept dry so it must be kept in an enclosed room away from inclement weather. The electrical circuits must not get wet. If for some reason they do get wet they must be thoroughly dried before operating the kiln. Some people keep their kilns in unheated garages or sheds. This is OK as long as the room is dry. The DynaTrol has a specification that says it can work from 32°F to 125°F. These limits can be exceeded somewhat, particularly on the low end. On the low end it has more to do with the accuracy of the control. As the kiln reaches the point where accuracy is an issue then the control will most likely be warmed sufficiently by the kiln to insure that it is operating within spec. However, on the high end, the electronics could degrade if operated for long periods above 125°F. Your kiln room should be dry and well ventilated. Never operate in an enclosed space unless you have good ventilation. Aside from issues of ventilating the fumes from the firing, the heat build up in an enclosed room could present a significant fire hazard. We recommend room ventilation of at least 25-50 times the cubic feet of the kiln per minute. For example, if a kiln has 10 cubic feet then 250 to 500 cubic feet per minute should be adequate. Read this post for a much more precise way of calculating ambient heat ventilation. Our suggestion is to get a variable speed fan for ambient room ventilation and keep a thermometer on the wall. That way you can vary the ventilation to suit the needs of ambient heat conditions in the room. Grainger or a large home equipment hardware store like Home Depot is an excellent source for ventilation equipment. In addition, we recommend our VENT-SURE downdraft kiln vent system. This will do most of the venting of the fumes of the kiln, will help cool the kiln, will improve uniformity of firing in the kiln, and will help maintain the oxygen level in the kiln (which is important for certain glaze effects as well as good element life). Click here for information on the Vent-Sure vent system. Kilns put out a lot of ambient heat. If you need to size HVAC units to handle this see this for a various charts of maximum BTU output for many of our kiln models. You must be sure to protect any children that may be near the kiln. Ideally, the kiln should be secured in a space away from any children (especially in a schoolroom situation where children might not always follow safety precautions). Aside from fumes that must be ventilated, and flammability concerns, there are two other major safety considerations. First is the extreme temperature of the outside of the kiln. This can get up to over 400°F. We suggest displaying a sign near the kiln that specifically warns everyone of how hot the kiln is. The other main consideration is the electrical power in the kiln. If power is on when you are loading or unloading the kiln it is possible to touch the elements and get electrocuted. We recommend having the kiln attached to a fused disconnect switch with a lockout device. Excellent instructions are included with our kiln and on this web site. You can download any of these from our Instructions link on our web site before you get the kiln. Complete safety instructions are included in the kiln instructions. Make certain floor is not flammable and install no closer than 12" to any wall. (18” is preferable). Note that, when we did all our testing for UL499, temperatures where measured 12” from the walls of the kiln and found to be safe from a flammability standpoint. Recommended floor surfaces are cement, ceramic tile, stone, slate, cinder blocks or brick. Make sure there is adequate clearance in the room for opening the kiln lid, and for periodic maintenance such as opening the element connection boxes, opening the control panel, thermocouple replacement, etc. 18” to 24” clearance around the outside wall of the kiln is usually sufficient. Remember that the kiln is putting out heat over a long period of time and that this could very well start a fire under certain conditions. Also, if an overfiring occurs materials like glass and glazes can be super-heated and electrically conductive and they can melt right through the kiln floor. If there is a combustible floor, this could cause a fire. Also keep in mind the continued heat of the kiln can dry out combustible surfaces over time and reduce their flash point. See the information below concerning the National Fire Protection Association NFPA 86. See dimensions.pdf for specific minimum dimensions needed for each kiln model. You may want to check with your local building inspector if you are uncertain what codes may apply to the installation of a kiln. This does vary from place to place. It may also be a requirement of your insurance policy. In any case, you will never go wrong in having a UL499 listing label on any appliance. Most building inspectors will accept this as adequate evidence of proper adherence to national safety standards. Click here to find out which L&L kilns are listed. Be sure your electrician follows the National electric code and any other local requirements when hooking up the kiln. See the NEC entry on Wikipedia. To the best of our knowledge, the NFPA has nothing specific about the installation of kilns. The NFPA 86 goes into considerable detail about industrial furnaces and ovens but generally with respect to internal processes and gas fired equipment. There is one section in the NFPA 86 (Section 2-1.5 concerning Floors and Clearances) that might be construed as applicable to kilns. It requires that temperatures at combustible ceilings and floors be kept below 160°F (71°C). You will of course need an appropriate number of shelves and posts to load your ware. If you are buying a replacement kiln you may already have the correct shelves. Check the sizes and make sure they will fit into your new kiln. For instance, if you are buying a new 10 sided kiln that has 3” brick and you had a 10 sided kiln with 2-1/2” brick the old shelves will not fit (21” diameter shelves vs. the newly needed 20” diameter shelves). Note that shipping can be expensive for a shelf kit and that you will save a considerable amount of money if you order a shelf kit with your kiln. It is usually a good idea to have a pair of heat resistant gloves for removing peephole plugs and unloading the kiln. If you intend to observe witness cones while the kiln is firing you should wear shaded safety glasses. See Accessories. It is a very good idea to fire your kiln every time with witness cones. Read this for more information. See the Orton Tips for more information on this. They can easily be purchased after you get your kiln. You can buy pyrometric cones from either your local clay or ceramic supplier or directly from Orton. See (www.ortonceramic.com). Complies with state and local codes and regulations. Carries the proper business and workers compensation insurance.x Is knowledgeable on a wide range of new equipment, technology and design procedures. Has a local facility, and is willing to have you visit. Is prompt and courteous and provides fast, reliable service -- attempting to perform service at your convenience. Is neat and well-groomed. This neatness should be reflected in their vehicles and offices as well as their personal appearance. Provides a detailed written proposal, clearly outlining the work to be done and the agreed upon cost, including labor and materials. Make sure you understand every word of any contract before you sign it. Ask for references. Find out if other customers were satisfied. Check with the local Better Business Bureau regarding any filed complaints. Compare price. Get bids from a few contractors. Make sure you give each contractor the same specifications and materials needed for the job. Remember! How a company treats you now reflects how they will treat you if there's a problem. A quality electrical contractor listens to your problems, understands what you want accomplished and is willing to follow up after the work is completed. [ ]- I am going to manually vent the kiln but I have adequate room ventilation for this. 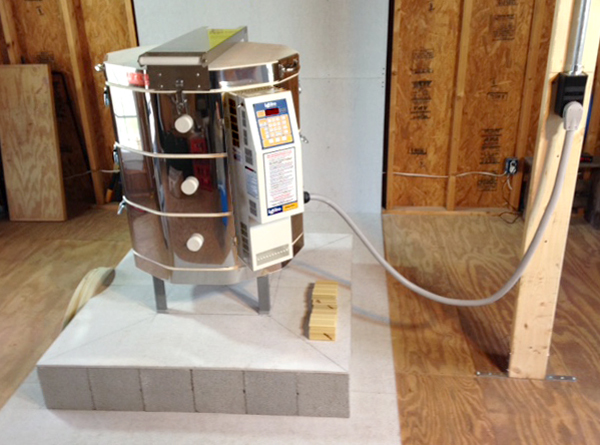 [ ]- I can install the kiln at least 12” away from any wall. [ ]- My kiln room floor is non-flammable. [ ]- I have a dedicated fire extinguisher or sprinkler system for the kiln room or kiln. [ ]- UL499 listing is required. [ ]- UL499 listing is not required. [ ]- You are using a licensed electrician who knows the National Electrical Code and any other local codes. [ ]- Children will be adequately protected from hot kiln. [ ]- There will be wall or other permanent fixture to attach the kiln lid safety chain (on the Jupiter kilns) to a nearby wall or post. (This is self contained on the DaVinci kilns). Download this before you order or ship a front-loading Hercules or Easy-Load kiln.